Waterfront UTC, South Side Three Road, Chatham, Kent, ME4 4FQ. Waterfront UTC is located on The Chatham Waters regeneration site which is located at Chatham Docks and is located approximately 1.5 kilometres north of Gillingham Town Centre, 3.5 kilometres north east of Chatham Town Centre and 50 kilometres from central London. The site is bordered to the north by the River Medway and to the east is a mixed use development known as Victory Pier which is currently under construction by Berkeley Homes and a newly built ASDA store. 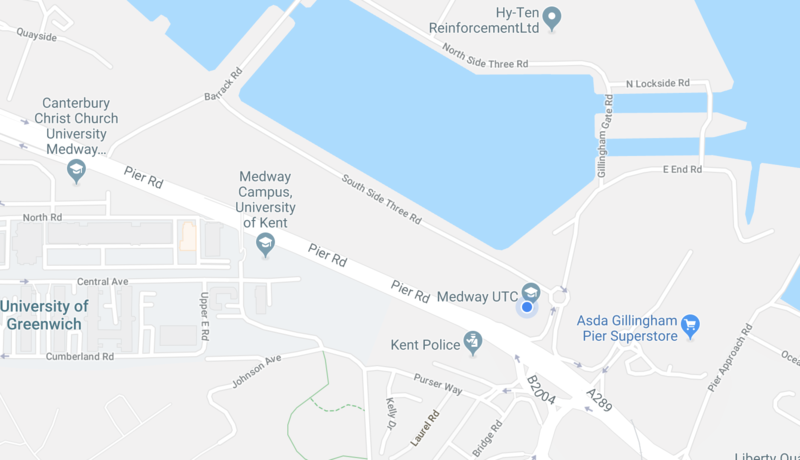 To the south, vehicular access is taken from the A289 Pier Road, which is a dual carriageway, on the opposite side to the main Medway Police Headquarters. Chatham Waters will offer those based here a delightful waterside environment with great rail and road links to Central London, Canterbury, Maidstone and West Malling. Some of the most beautiful Kent countryside and seaside locations are also within close proximity offering a number of outdoor activities.